I have an email address that someone else thinks is theirs and they sign it up for stuff all the time, this is a great feature that I have been using a lot to unsubscribe from grocery stories and shop email lists and it seems to work. I have the exact same problem too. Its kind of funny. They even signed up to Facebook and Skype using my email. I took over the accounts and had some fun with it. Why are people so stupid. It works for the good players — the legitimate bulk emailers who follow good standards and put unsubscribe info in the email headers. In other words, the honest ones. It does absolutely nothing to help spam since everything about spam emails is fake. How about unsubscribing from recurrent emails that you suspect are phishing – like from Maria the fortuneteller. I’m afraid to click anywhere on her email. I just delete. 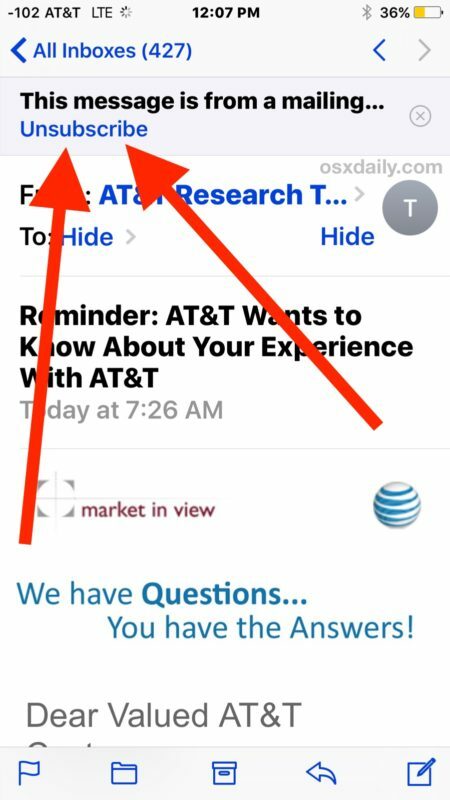 Is there a way to block these emails? If you have a gmail address, you can go to gmail settings I a web browser, Filters and Blocked Addresses, Create a New Filter (at the bottom) selecting Mark as read, Delete it. You will never see these emails in your inbox again. i would just mark those type of fortuneteller emails as spam and manage the inbox rules. Gmail has good spam filters and should filter out that kind of stuff too, even if it’s used in iOS or MacOS. I create rules that delete email from the address. Far more effective. I have an iPhone 6 will all the updates. I’ve used that feature 6 times. It’s like they are just stuck there in auto unsubscribe purgatory.